The army has this morning launched a major assault on the Ganfouda terrorist enclave in Benghazi. At least 20 tanks are reported to have been attacking from the west while LNA forces appear to be pressing forward all around the perimeter while naval vessels bombard from offshore. The assault, which began this morning in torrential rain, has seen an unknown number of casualties. Among the injured is the 298 Tank Brigade’s commander brigadier-general Naji Al-Moghrabi. 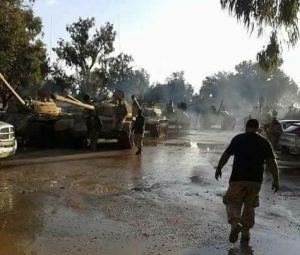 The LNA says that it has destroyed the terrorists’ only tank and has captured at least six militants. It is claiming that it now controls more than 90 percent of Ganfouda.